Humorist P.G. Wodehouse had written that English noblemen were at a loss on how to deal with younger sons. While the firstborn inherited the title and estate, the younger ones had to make their own way in the world. In the Victorian-era England, they either joined the army or became priests. Some regional political lords in India, who are blessed with more than one son, also have a similar problem. Only that they don’t know what to do with their elder sons, as the younger ones have overtaken them on the political ladder. 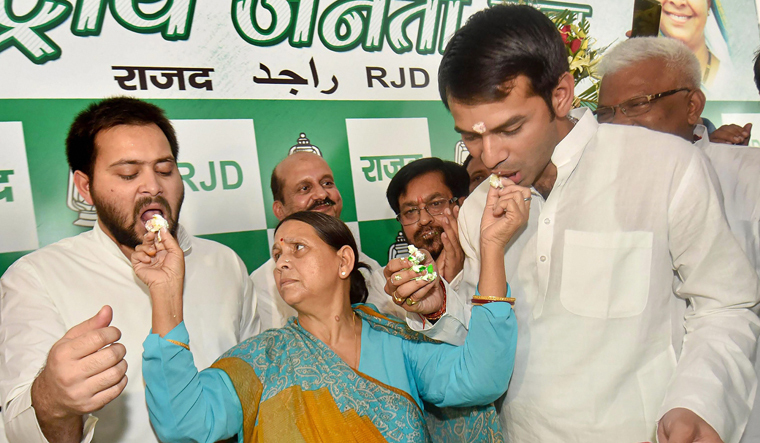 Rashtriya Janata Dal chief Lalu Prasad’s eldest son Tej Pratap recently tweeted that he would go into exile, comparing himself to Yudhishtira, the eldest of the Pandavas. Tej Pratap wants to leave Hastinapur (Bihar) to Arjuna (comparing his younger brother and former deputy chief minister Tejashwi to the the mythic warrior). He was peeved that orders from “above” were stifling him, though he targeted a non-family functionary acting as a compliant president of the Bihar unit of the party. Lalu is the party’s national president and his wife, Rabri, the leader of the opposition in the legislative council. Tejashwi is the leader of the opposition in the assembly and Lalu’s daughter Misa Bharti, a Rajya Sabha member, is the leader of the parliamentary party. Another brother who has been playing second fiddle to a younger sibling is H.D. Revanna, the second son of H.D. Deve Gowda. He has ceded political ground to H.D. Kumaraswamy, Gowda’s third son and Karnataka chief minister. Though Revanna, the legislator from Holenarasipura, wanted the energy portfolio, Kumaraswamy kept the money-spinner to himself. Adding to the complication is the growing tussle in the next generation. Revanna’s younger son Prajwal wants to be one up on Kumaraswamy’s son Nikhil. Interestingly, Deve Gowda’s eldest son, a retired government employee, and youngest son, a doctor, have kept themselves away from politics. In Tamil Nadu, DMK patriarch M. Karunanidhi sidelined his second son M.K. Alagiri—who was fertilisers and chemicals minister in the Manmohan Singh government—when he challenged M.K. Stalin, Karunanidhi’s third son and chosen successor in the DMK. Even Alagiri’s sons have been kept out of the political equation as Stalin is promoting his own son, Udhayanidhi, as the third-generation leader of the dynasty. For the dynasts in Maharashtra, the problem is not sons, but nephews. Bal Thackeray’s son Uddhav and nephew Raj fought hard for the control of the Shiv Sena, until Uddhav prevailed. In the Nationalist Congress Party, Sharad Pawar has not made himself clear on succession, but his daughter Supriya Sule is busy being a parliamentarian in Delhi, while his nephew Ajit is the all powerful leader of the party in the state assembly. In Punjab, Akali Dal supremo Parkash Singh Badal pushed nephew Manpreet out of the party to clear the way for his son Sukhbir. Manpreet is now finance minister in the Congress government. Tej Pratap, meanwhile, may have to be content playing second fiddle to Tejashwi in the political long haul.